There is no time like now to start achieving your goals. It is as simple as ready, set, go. Yes, it is that simple although it is not easy. Let’s take it from the beginning and create our action plan. A goal must be worthwhile to you and must motivate you. What are your biggest dreams? Do an inventory of your dreams and put them on paper. Visualize them and verbalize them. This will build the motivation to achieve your goal. If you have made goals in the past and have not achieved them one reason may be that you did not have a burning desire and, therefore, you were not driven to achieve them. New Year’s resolutions fall into this category many times. When you think about your life, your daily journey, how well do you plan and organize it? Your life’s journey is the MOST important trip you will ever take. So why is it that we spend more time planning a two-week vacation than planning our life’s work? Our life’s work would include a balance between personal goals and career goals. A balanced approach might include personal goals in areas such as mental development, ethics, family, physical, financial and social. The career and business goals might include the following: productivity, time management, people skills, and influencing skills. W – Goals should be Written. H – Goals should be Harmonious with you purpose and dreams in life. Y – Goals must be Yours and reflect your personal vision and burning desire. S – Goals must be Specific. Vague goals cause confusion and frustration. 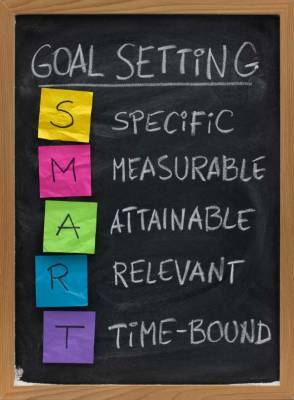 M – Goals must be Measurable. Attain annual sales of 4 million dollars is a measurable goal; developing a goal of increased sales is vague and not at all measurable. A - Attainable goals spark excitement and action. Goals that are beyond reach produce frustration and discouragement. Attainable goals should also provide a challenge. R – Goals must be Realistically high and results oriented. Challenging goals stimulate creativity and commitment. Look at your calendar. You will find: Sunday, Monday, Tuesday, Wednesday, Thursday, Friday, and Saturday. What you will not find is Someday. So not only does someday never come, it doesn’t exist! Would you like to turn your goals into results now?